To shop without money, to find things at bargain prices, and to sell things that you don't want or need - you'll find Swap.com Valet Service is one of the best ways to do so. Swap.com Valet Service is an online trading website and it's like going to a big online swap meet! It is the largest online kids consignment store. It is the largest online kids consignment store. The items that you can buy or sell include that for babies, toddlers, and kids clothes, accessories, toys, games, gear, movies, books, music, decor, sport products, and a lot more. 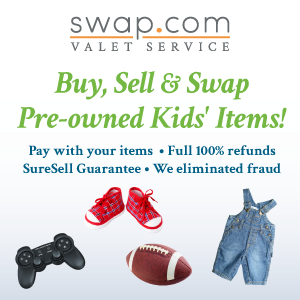 Swap.com Valet Service helps you get to swap kids items. It's a safe way to purchase or swap second hand goods as it has been checked as the items that are for swapping and for sale are sent by the seller to the website to be sorted out, photographed, and listed.and this online trading website will do the task for you, without any need to meet up with the seller or buyer, and it has the reputation of reliability so you are sure that you will get paid and your orders will be sent. It's convenient as Swap.com Valet service will take care of trading the items. And what is even better, they have a SureSell Guarantee to buy the item you are trading in 45 days if it is not sold. Now, the guaranteed price goes up to 30 percent of the item's average retail new price, and since what you are selling would be used goods, then that would be a pretty good deal if you can't get to trade it. Swap.com Valet Service answers your shopping needs. If you would like to buy things for your kids like toys at low prices, you don't have to go searching at garage sales and get to see it online with the assurance that the item is in good condition. Swap.com Valet Service answers your selling needs. Kids grow up so fast and those pair of shoes and other clothes plus toys they are no longer interested and more can be converted into cash or swapped to get other things at this online trading website, Swap.com Valet Service. Have you used the Swap.com Valet Service? Share your review!